I’m making several new recipes with candied kumquats and cranberries for the holidays. Some of them will be perfect for New Years Eve too! Also, here is my recipe for Candied Fruit, although most of it is not really fruit! It is a variation on the one I used in the Mincemeat Pie and Fruitcake recipes from Carb Wars .The Christmas Pudding is in Nourished. I am including the pudding recipe here. Happy Holidays! Cut cranberries in half. Peel ginger root and cut into very thin slices and then into small dice. Remove zest (thin, orange-colored part of peel) from orange in thin strips with a zesting tool or remove with a vegetable peeler and cut crosswise into thin strips. Place halved cranberries, ginger, and orange zest in a shallow pan just large enough to hold them in one layer and add water. Stir in polydextrose and sweetener. Heat to boiling. Reduce heat to simmer and cook on low heat, stirring, occasionally at first, and more often as the syrup thickens, until most of the water is evaporated and the fruit is very sticky and glossy, about 30 to 40 minutes. Lift fruit out with a slotted spoon and place in a strainer set over the pan so any liquid drains back into the pan. Set pan with drained juice and gooey residue, the utensil used for stirring, and strainer aside to make syrup for finished puddings. Reserve a few cranberry pieces for garnish. Put ½ cup water into the pan used for making Candied Fruit. Stir with original utensil and swish the strainer in the hot liquid to dissolve and recover any sticky residue. Cook over low heat until reduced to a thick syrup. A spectacular finale for a festive holiday meal. 1 recipe (1½ cups) of Custard Sauce (p. 91 in Nourished). Preheat the oven to 325º F. Butter 10 cups of a 12 cup muffin pan and a piece of foil to cover the top. Place the drained Candied Fruit mixture, Dried Cranberries, and currants, if using, in a bowl and sprinkle with ¼ cup of the whey protein powder. Toss to coat, separating pieces by hand. Stir in nuts. Separate the eggs, putting the whites in one mixing bowl and the yolks in another. Add sugar substitute and remaining 2 teaspoons whey powder to the bowl with the egg yolks. Beat until thick. Beat in the molasses, melted butter, cream, and extracts. In a third bowl, whisk the almond flour, baking powder, baking soda, and whole-wheat or gluten-free flour together and then stir into the batter. for 15 minutes until risen. Remove the foil and bake for an additional 10 minutes, or until the puddings are firm in the middle and brown on the edges. Place the pan on a rack to cool for 10 minutes. Remove the puddings from the pan. Invert onto serving dishes and drizzle with a spoonful of the syrup from the Candied Fruit. 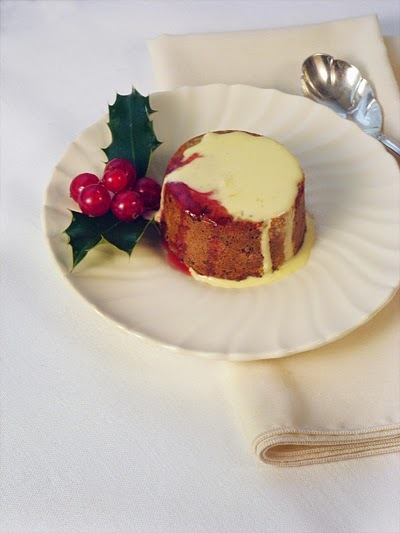 Serve warm, topped with Custard Sauce and garnished with reserved candied cranberries. Makes 10 puddings of about ½ cup each. *You can substitute Bob’s Red Mill gluten-free flour for the white whole-wheat flour. I added 1/2 teaspoon of xanthan gum and it worked fine. amount of sugar or fat needed and to add beneficial fiber. One ounce has a total of 27 grams of carbohydrate and 25 grams of fiber for a net carb count of 2 grams. Recipes were tested with Stay-lite III polydextrose from Honeyville Grain. Candied Fruit, Christmas Pudding, Festive Dessert. Bookmark.